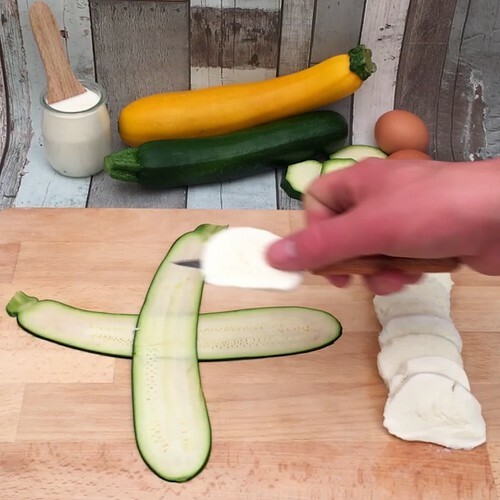 Cut the zucchini into thin slices using a peeler, and the mozzarella balls into thin slices with a knife. Place 2 slices of zucchini crossways over each other and put a slice of mozzarella in the middle. Fold the edges of the zucchini around the mozzarella and stick a toothpick into the centre of each parcel. Repeat the process to form as many parcels as possible. Coat the parcels in flour, beaten egg, grated parmesan and breadcrumbs. Fry the parcels for 2 minutes in hot oil, then drain and remove the toothpicks. Serve warm with tomato sauce to dip.